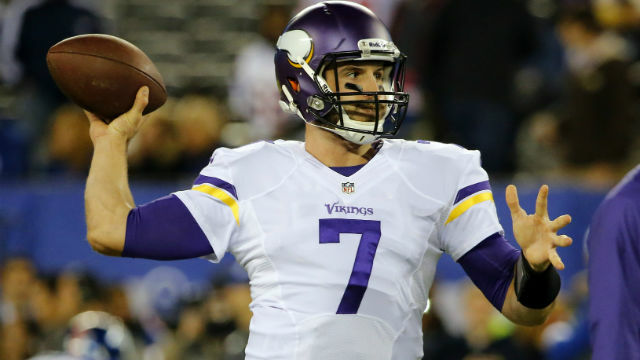 Related: 2013 Fantasy Football: Flint Michigan Megabowl’s Thurman Murmans Week Seven Results The quarterback carousel will apparently continue for the Minnesota Vikings, as Josh Freeman is reportedly dealing with a concussion after his dismal debut against the New York Giants on Monday night. Christian Ponder is now expected to start in Week 8 against the Green Bay Packers after starting the first three games of the season, suffering a rib injury and losing his job to Matt Cassel and then Freeman. Fantasy football owners that even had him on a roster surely dropped Ponder like a bad habit after his injury, but is he a viable option for Week 8? Ponder missed Minnesota’s playoff loss to the Packers last January with an arm injury, but he performed well against them at home in the regular season finale, going 16-for-28 for 234 yards and three touchdowns without an interception. It’s worth mentioning he had one of his worst games of 2012 at Lambeau Field against Green Bay (12-for-25 for 119 yards, one touchdown and two interceptions), but Sunday night’s game is a home. The Packers enter Week 8 allowing the 10th-most fantasy points to opposing quarterbacks (17.8 per game, ESPN scoring) and that would be worse if not for facing Brandon Weeden of the Cleveland Browns in Week 7 and allowing just 149 passing yards and one touchdown. Ponder may not be a significantly better player than Weeden, but he at least has some positive history against Green Bay at home. With six teams on a bye this week, some fantasy owners may find themselves thin at quarterback with Andrew Luck, Philip Rivers and Joe Flacco idle. Ponder should not be considered as a strict bye week fill-in for Luck or Rivers, but those that are searching for a QB2 in deep two-quarterback leagues could consider him as a plug-and-play for Week 8. The quarterback carousel will apparently continue for the Minnesota Vikings, as Josh Freeman is reportedly dealing with a concussion after his dismal debut against the New York Giants on Monday night. Christian Ponder is now expected to start in Week 8 against the Green Bay Packers after starting the first three games of the season, suffering a rib injury and losing his job to Matt Cassel and then Freeman. Fantasy football owners that even had him on a roster surely dropped Ponder like a bad habit after his injury, but is he a viable option for Week 8? Ponder missed Minnesota’s playoff loss to the Packers last January with an arm injury, but he performed well against them at home in the regular season finale, going 16-for-28 for 234 yards and three touchdowns without an interception. It’s worth mentioning he had one of his worst games of 2012 at Lambeau Field against Green Bay (12-for-25 for 119 yards, one touchdown and two interceptions), but Sunday night’s game is a home. The Packers enter Week 8 allowing the 10th-most fantasy points to opposing quarterbacks (17.8 per game, ESPN scoring) and that would be worse if not for facing Brandon Weeden of the Cleveland Browns in Week 7 and allowing just 149 passing yards and one touchdown. Ponder may not be a significantly better player than Weeden, but he at least has some positive history against Green Bay at home. With six teams on a bye this week, some fantasy owners may find themselves thin at quarterback with Andrew Luck, Philip Rivers and Joe Flacco idle. Ponder should not be considered as a strict bye week fill-in for Luck or Rivers, but those that are searching for a QB2 in deep two-quarterback leagues could consider him as a plug-and-play for Week 8.